2004-07-07. New. Ships with Tracking Number! INTERNATIONAL WORLDWIDE Shipping available. Buy with confidence, excellent customer service! New York: Viking. 2003. First Edition; First Printing. Hardcover. 067003231x . Near Fine in a Very Good+ dust jacket. Soiling. Sticker to front panel. ; Signed by Philbrick on front freepaper. ; 8.90 X 6 X 1.30 inches; 480 pages; Original unclipped dust jacket protected by archival Brodart cover. All domestic orders shipped protected in a Box. ; Signed by Author . 2003-11-10. Good. Ships with Tracking Number! INTERNATIONAL WORLDWIDE Shipping available. May not contain Access Codes or Supplements. May be ex-library. Shipping & Handling by region. Buy with confidence, excellent customer service! Harper Collins, 2004-05-01. illustrated edition. Hardcover. Used:Good. New York, New York: Viking Penguin, 2003. Fine. Illus. with B&W photos, drawings and maps. Incl. Notes, Selected Biblio, and Index. (xxvii) 452 pp.. Signed by Author. First Edition, 1st Printing. Hard Cover. As New/As New. Penguin (Non-Classics). PAPERBACK. B0085SCMWI . New. Penguin (Non-Classics). PAPERBACK. B0085SCMWI Remainder mark . Fine. Penguin (Non-Classics). PAPERBACK. B0085SCMWI Minor shelf wear . Very Good. Penguin (Non-Classics). PAPERBACK. B0085SCMWI signs of little wear on the cover. . Very Good. Bew York: Viking. Hardcover. 067003231X america's voyage of discovery the u. s. exploring expedition 1838-1842. 2 copies available. . Fine. 2003. First Edition. Viking. Hardcover. 067003231X New Condition. . New. Harpercollins Pub Ltd. PAPERBACK. 0007121164 New Condition. . New. HarperCollins Publishers Ltd. Hardcover. 0007121156 New Condition. . New. 2004-07-07. Good. Ships with Tracking Number! INTERNATIONAL WORLDWIDE Shipping available. May not contain Access Codes or Supplements. May be ex-library. Shipping & Handling by region. Buy with confidence, excellent customer service! Penguin Books. PAPERBACK. 0142004839 . New. Penguin Books. PAPERBACK. 0142004839 Minor shelf wear . Very Good. Penguin Books. PAPERBACK. 0142004839 signs of little wear on the cover. . Very Good. Viking. Hardcover. 067003231X New Condition *** Right Off the Shelf | Ships within 2 Business Days ~~~ Customer Service Is Our Top Priority! - Thank you for LOOKING :-) . New. First Edition hardcover, pages are clean, crisp, binding tight. Cover boards fine, in fine dust jacket fine, a pristine copy inside and out. --America's first frontier was not the West; it was the sea. In 1838, an enormous expedition headed by the young, brash Lieutenant Charles Wilkes set out for the Pacific Ocean with six ships and hundreds of sailors on what would turn out to be a wide-reaching journey of adventure, discovery, and controversy. Literally broadening our horizons, the Exploring Expedition's ships covered the Pacific Ocean from top to bottom, discovered a new continent that Wilkes would name Antarctica, and brought America to the world's attention for its scientific endeavours as well as its bravado. 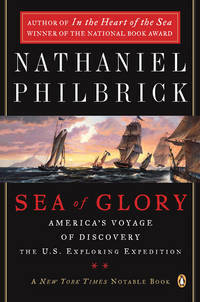 Using diaries kept on board, historian Nathaniel Philbrick uncovers the dark saga that the official reports never told. As New in As New dust jacket. 2003. First Edition; 1st Printing.. Hardcover with dust jacket.. 067003231x . First Edition. Book is a hardcover. Book and dustjacket are in As New condition. Tells the stories of the people who sailed the ocean the get to America. Published by Viking Press. 452 pages. ; 8vo 8" - 9" tall; 452 pages . Edition: First Edition; 1st Printing. PENGUIN. New. 9.54 x 8.7 cm. Large Print Press, 2004-10-26. 1st. Paperback. Used:Good. 2003, 1st edition, fine condition, with a near fine dust jacket, minor closed tear to top edge of dust jacket,with a priced unclipped dust jacket flap, published by Viking, New York, 452 pages. The United States Pacific Ocean Exploring Expedition of 1838-1842 under the Command of Lieutenant Charles Wilkes. Illustrated with photographs of drawings, area maps of the then known Pacific Ocean, and an extensive selected bibliography. .
HarperCollins Publishers Ltd. Hardcover. 0007121156 Like New Condition. . Fine. Thorndike Press, 2004-01-02. 1. Hardcover. Used:Good. Viking. Hardcover. 067003231X Like New Condition. . Fine. Harpercollins Pub Ltd. PAPERBACK. 0007121164 Like New Condition. . Fine. Penguin. Used - Very Good. Great condition for a used book! Minimal wear. Thorndike Windsor. 2004 Thorndike Windsor first UK edition thus, large print hardback; Very Good ex-library copy, usual plate and stamps, nice clean copy, laminated pictorial boards, no dj; UK dealer, immediate dispatch . Very Good. Hardcover. 1st Edition Thus. 2004. Viking, 2003 America's voyage of discovery the U.S. Exploring Expedition 1838-1842. Orange/red binding with black spine with gold lettering. 452 pages text clean and tight. Full number line 1-10. SIGNED. It does have a sticker on the front saying signed too. Has not been price clipped. Penguin Books. PAPERBACK. 0142004839 . New. 2014.